There is now a video about Side by Side Singing! It is just under nine minutes long. It includes clips of us singing during sessions — you’ll hear parts of “Somewhere Over the Rainbow,” “Side by Side,” “Happy Trails,” “This Little Light of Mine,” and others. We are a lively and enthusiastic group of singers!!!! 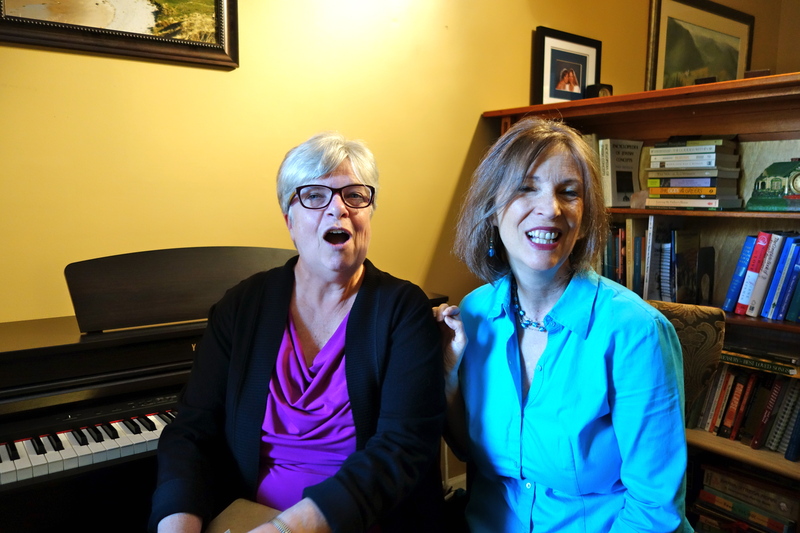 The video also includes Debbie and Ruthie talking about Side by Side and some of the health benefits of singing. We couldn’t list ALL the health benefits of singing or it would have been waaaaay too long. Carolina on October 23, 2014. 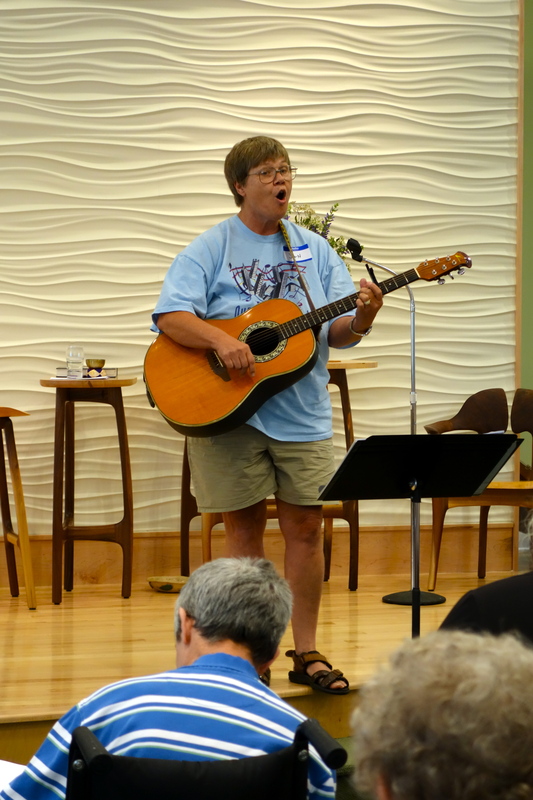 We told them how good singing was for healthy aging and gave them a taste of a Side by Side sessions. But recognizing that there isn’t always a Side by Side Singing session handy, we also prepared a hand-out with ideas for incorporating music into your everyday life — especially helpful for those who have cognitive disorders. 1) Play CDs of your loved one’s favorite songs by favorite artists so she/he can join in singing. 2) Create a lyrics notebook of favorite songs by downloading free lyrics. 3) Install free pandora internet radio on your computer or roku tv device. Pandora offers hundreds of choices. 4) Sing along with YouTube videos by searching favorite artists or old shows such as the Lawrence Welk or Andy Williams show. You can also search for specific songs. 6) If your loved one played an instrument in younger years, get it out, dust it off and encourage him or her to play it again. 7) Play the “Lyrics Relay Game.” It goes like this, you sing “Oh we ain’t got a barrel of — ” and pause for the other person to fill in the missing word. He will sing, “Money, maybe we’re —-” then YOU to fill in a word and keep singing. Keep tossing the song back and forth like a football. 8) Whistle while you work (or hum if you can’t whistle). 9) Dance together to favorite music. 10) Play the “Opera Game.” Instead of speaking to each other SING to each other in wildly dramatic ways as if you were in an opera. “What are we having for SUPPER TONIGHT?? ?” “We are having (dramatic pause) macaroni, macaroni, roni, ro-NIIIIII” You get the idea! 11) Buy an iPod and install your loved one’s favorite music. Debbie Nordeen and Ruthie Rosauer trade off on the piano. We’ve had drums from time to time — most memorably on “The Lion Sleeps Tonight.” The last two Side By Side sessions in the Hendersonville location found Ruthie on the clarinet for Yo Lisa Goy (aka The Vine and Fig Tree), I’ve Been Working on the Railroad, Those Were the Days (which we have re-written slightly to be THESE Are the Days), and the Hebrew round Shalom Chevarim. We also added a new song to our repertoire from Fiddler on the Roof — “Sunrise, Sunset.” The clarinet can embellish the melody line — or help carry the melody to free up singers to explore possible harmony lines to add to the joyful sound we make together. 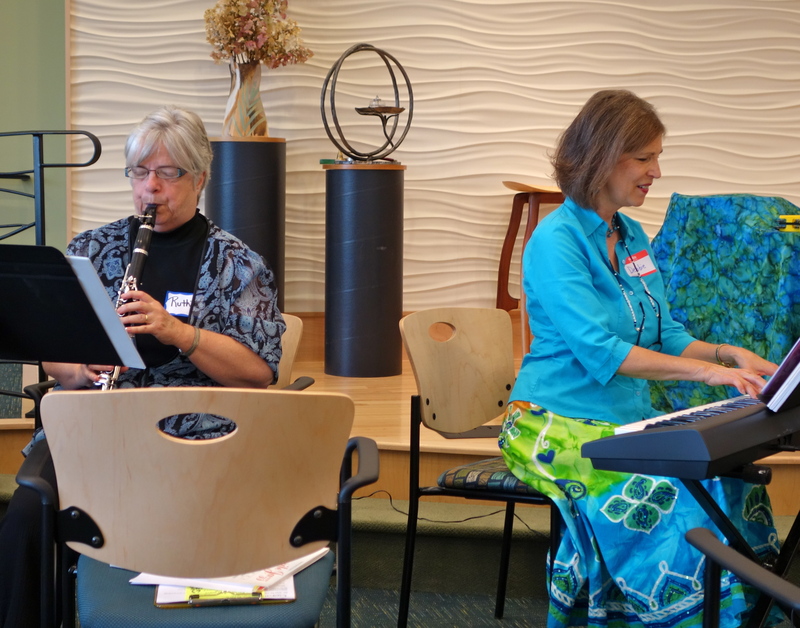 Ruthie Rosauer plays clarinet (on left) and Debbie Nordeen on piano for group singing of Sunrise, Sunset.